Found this thing on rv today, thought twig, then it moved. That is a location antenna for wood ticks so they can always be aware of your presence, ain't technology great ! It's an organic back scratcher. My entire life,and all the hours I have spent outdoors,I may have seen only 6 or 8 of them. Pretty cool little critter for sure. Yea I’ve seen a bunch here from time to time. They weird looking insects. THIS is a magnum sized Walking Stick. It dropped down from a tree in Raja Ampat off Papua New Guinea when I was doing a surface interval on a dive trip there a few years ago. They get bigger than this one, if you can believe it. I'm sure this is far from scientific but we always called them "spit devils" when I was growing up. 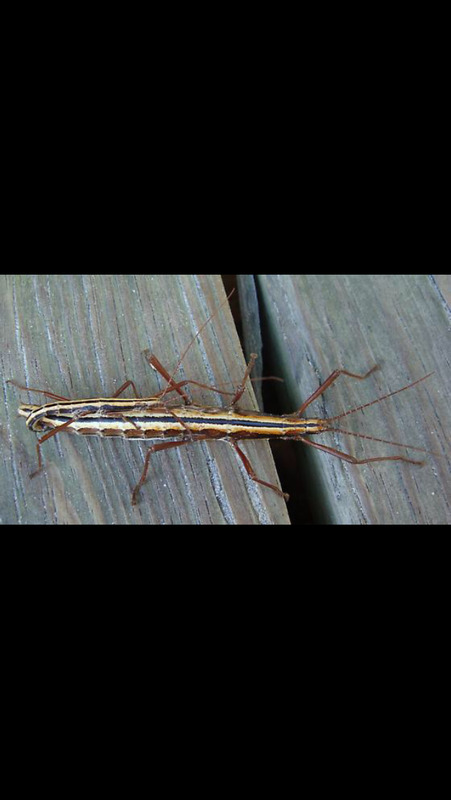 That’s a pretty common name for the Two Striped Walking Stick which is fatter and can spray a chemical from its back. The skinny ones are harmless. You’re safe from the chemical spitting variety up there in Michigan. They only roam the Southeast. I’ve lived in TN all my life and spent an uncommon amount of my childhood outside. I see the skinny kind regularly but had never seen a Two Striped or even heard of it until we bought our first house in 2014. In the summer there would be a dozen mating pairs on the brick outside every night. I killed hundreds and there were always more. Moved last year and havent seen one since.